Sugar cookies and chocolate chip cookies are packed up, ready to go, and I just got all my baking sheets washed and cooling racks in the dishwasher–it’s time to wake up my 3 year old and get a move on. But first, I wanted to get a quick post up to tell you all Happy May Day! 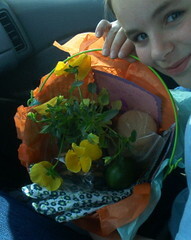 friend and her family sneaking by to drop off a May Day basket! Your neighbors will be astounded, and what a great opportunity it is to reach out to those around us! It’s not too late in the day, either! I’ve got to get a move on, we’ve got goodies to deliver! Hope you feel better today, Juli, it’s been a while! And we did have a fabulous (though BUSY) May Day! Mmmm…homemade cookies, me want some! Hey, I finally added a May Day basket picture…better late than never!